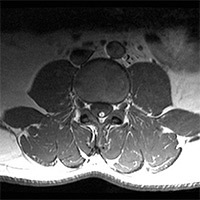 A 46-year-old male with a history of chronic back pain presented with two months of acute low back pain and right leg sciatica. Aside from mild degenerative disc disease and degenerative joint disease, no large disc protrusion or extrusion was detected. The conus medullaris was low-lying (L3). Furthermore, the filum terminale was thickened, and extended to the level of the sacral canal. Embedded within or upon the filum terminale was a linear band of strong T1 hyperintense signal that suppressed out upon short tau inversion recovery, or STIR, imaging. Tethered cord with a filum terminale lipoma/fibrolipoma. Tethered cord syndrome (TCS), often seen with occult spinal dysraphism, prevents normal cord movement during flexion/extension, and can halt cranial migration of the conus medullaris during development. TCS likely occurs due to loss or infiltration of the viscoelasticity of the filum. One mechanism of filum development interruption can be due to fatty infiltration, called a fatty filum terminale or fibrolipoma of the filum terminale. Fatty filum terminale can exist in isolation without concomitant TCS. Imaging demonstrates a nonenhancing linear structure in dorsum of the filum with fat signal characteristics. • adults: scoliosis, change in bowel or bladder habits, pain and/or weakness radiating down lower extremities. Similar appearing lesions include intraspinal lipoma, which is intimately associated with the spinal cord. This is usually larger than a filum terminale fibrolipoma, and produces more symptoms. Additionally, intraspinal lipomas will conform to the dura, and distort the normal cord shape. Another similar-appearing entity is a lipomyelocele/lipomyelomeningocele, which presents with an intradural mass following fat signal. In both entities, spinal dysraphism can be seen, with an osseous defect through which cerebrospinal fluid and fat may collect in the dorsal subcutaneous tissues. Due to an enlarged subarachnoid space, the fat-cord interface occurs outside of the spinal canal with lipomyelomeningocele. In contrast, a lipomyelocele will demonstrate fat within the spinal canal, as well as a normal subarachnoid space. — Shivang Patel, DO, is a radiology resident at St. Barnabas Medical Center in Livingston, New Jersey. Bui CJ, Tubbs RS, Oakes WJ. Tethered cord syndrome in children: a review. Neurosurg Focus. 2007;23(2):E2. Sarris CE, Tomei KL, Carmel PW, Gandhi CD. Lipomyelomeningocele: pathology, treatment, and outcomes. Neurosurg Focus. 2012;33(4):E3. Thompson EM, Strong MJ, Warren G, Woltjer RL, Selden NR. Clinical significance of imaging and histological characteristics of filum terminale in tethered cord syndrome. J Neurosurg Pediatr. 2014;13(3):255-259. Fenton DS. 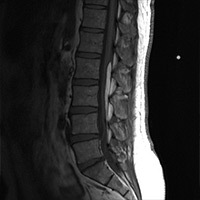 Tethered spinal cord. In: Czervionke LF, ed. 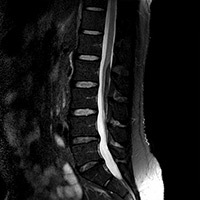 Imaging Painful Spine Disorders. Philadelphia, PA: Elsevier/Saunders; 2011:596-601.